New pictures available at LEGO Cache, show in detail some elements from 'Power Functions Kit ' (8293) elements. On the left you may find a more detailed image from the new PF lights (despite shown with shortened cables), while at right you may compare new parts cable lengths. Cool stuff. 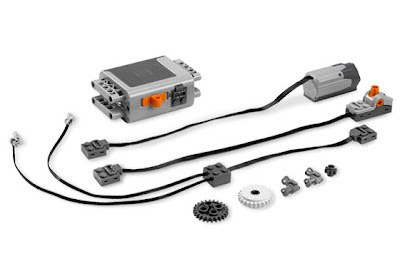 I'm digging this PF system (especially after seeing the low cost of the motors at LEGO S-a-H... wow!). So what are the random bits at the bottom there? I see what appears to be dark grey (bley) 24t and 8t gears, a white 24t clutch gear, and two universal joints that are folded over at 90 deg? Am I seeing that right? Yes you are seeing them right! The only point is that U-Joints are shorter than previous ones (3 studs instead of 4), which should allow for more compact designs. I have to say the LED's look mlike a spur-of-the moment design. The LEDs themselves have a very non-LEGO casing and did the reinforcement brick HAVE to be a full studded brick for integration into studless construction? It'll be as hard as the block on the NXT/RIS converter cable! 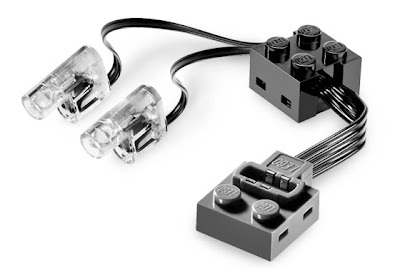 At least make it a 2/3 height bick like the rest of LEGO's non-NXT wiring! The reason that the UJ's are 3M (or studs) is to do with the Modular System which pivots around the middle unit as opposed to the old system which pivoted between the studs hence 2-2 or 4 studs long. I find this an interesting consequence of the change over. The problem is very evident on the combine harvester (8274) where the UJ Pivot does not align properly with the Mechanism pivot. I am surprised that with a mainly studfree PF design lego have opted for a studded brick in the cable, I would have expected a split to the socket or somethign else.